For the company, see Michael Kors (brand). Michael David Kors (born Karl Anderson Jr.; August 9, 1959) is an American fashion designer. He is the chief creative officer of his brand, Michael Kors, which sells men's and women's and ready-to-wear, accessories, watches, jewelry, footwear and fragrance. Kors was the first women's ready-to-wear designer for the French house Celine, from 1997 to 2003. On January 2, 2019 Michael Kors Holdings Limited officially changed its name to Capri Holdings Limited (NYSE: CPRI), of which Michael Kors is the Honorary Chairman and Director. Michael Kors, Jimmy Choo and Versace are the three founder-led brands under Capri Holdings Limited. Kors was born as Karl Anderson Jr.  on Long Island. Kors' mother is Jewish; his father was of Swedish descent. His parents are Joan Hamburger, a former model, and her first husband, Karl Anderson Sr., a college student. His mother married Bill Kors, when her son was five, and his surname was changed to Kors. His mother told Karl that he could choose a new first name as well and he renamed himself Michael David Kors. He grew up in Merrick, New York and graduated from John F. Kennedy High School in Bellmore, New York, on Long Island. Kors married his partner, Lance Le Pere, on August 16, 2011, in Southampton, New York, in The Hamptons. Kors' affinity for fashion started when he was very young. His mother thought his affinity might have been caused in part by his exposure to the apparel industry through her modeling career. Michael, at the age of five, even redesigned his mother's wedding dress for her second marriage. As a teen, Kors began designing clothes and selling them out of his parents' basement, which he renamed the Iron Butterfly. Kors also took acting lessons when he was young, but stopped when he was 14 when he decided to focus on becoming a fashion designer. In 1955, he enrolled at the Fashion Institute of Technology in New York City. However, he dropped out after only nine months and took a job at a boutique called Lothar's across from Bergdorf Goodman on 57th Street in Midtown Manhattan, where he started as a salesperson and went on to become both the designer and visual display head for the store. Shortly after, Dawn Mello, the fashion director at Bergdorf's, discovered Kors. She asked if he would show his collection to Bergdorf Goodman's buyers. In 1981, Kors launched his Michael Kors women's label at Bergdorf Goodman. In 1990, the company launched KORS Michael Kors as a licensee. A Chapter 11 filing in 1993, caused by the closure of the licensing partner for KORS Michael Kors, forced him to put the KORS line on hold. He got back on his feet by 1997 and launched a lower priced line and at the same time was named the first women's ready-to-wear designer for French house Celine. In his tenure at Celine, Kors turned the fashion house around with successful accessories and a critically acclaimed ready-to-wear line. Kors left Celine in October 2003 to concentrate on his own brand. Kors launched his menswear line in 2002. The MICHAEL Michael Kors line was launched in 2004, joining the original Michael Kors Collection label. The MICHAEL Michael Kors line includes women's handbags and shoes as well as women's ready-to-wear apparel. As of the end of the first fiscal quarter in 2016, Kors has over 770 Lifestyle stores around the world. Currently, Kors has Collection boutiques in New York, Beverly Hills, Palm Beach, Chicago and Southampton. In the U.S, his women's runway collection, labeled Michael Kors Collection, is sold at Bergdorf Goodman, Saks Fifth Avenue, Neiman Marcus, Bloomingdale's and numerous specialty stores. Michael Kors Collection is also carried at the brand's stores in London, Paris, Cannes, Milan, Tokyo, Hong Kong, Shanghai and Seoul. The year 2016 marked the 35th anniversary of Kors' business. In January 2014, Forbes reported that Kors reached a personal fortune in excess of $1 billion. Michael Kors Holdings had already "minted two billionaires": Silas Chou and Lawrence Stroll. Michael Kors at the conclusion of his Spring/Summer 2014 show at New York Fashion Week, September 2013. 2016: The World Food Program USA honored Kors with the McGovern-Dole Leadership award, presented by Vice President Joe Biden. 2015: Named a Global Ambassador Against Hunger for the United Nations World Food Programme. 2015: God's Love We Deliver dedicated the Michael Kors Building at the non-profit's new SoHo headquarters in honor of Kors' ongoing support. 2013: Selected for The Time 100, the magazine's annual list of the 100 most influential people in the world. He also made the New York Observer's list of the 100 Most Influential New Yorkers, under the fashion category, and was named to Out magazine's 2014 Power 50 List. 2013: Honored with the 2013 Couture Council Award for Artistry of Fashion by The Couture Council of The Museum at the Fashion Institute of Technology. 2013: Kors presented Hillary Rodham Clinton with the first-ever Michael Kors Award for Outstanding Community service. 2012: Honored with the Golden Heart Lifetime Achievement Award by God's Love We Deliver, a non-profit organization that distributes fresh meals to people living with HIV/AIDS and other diagnoses, which he has been involved with for over 20 years. 2010: Received the Oliver R. Grace Award for Distinguished Service in Advancing Cancer Research, an annual honor bestowed by the Cancer Research Institute, a U.S. nonprofit organization dedicated to advancing immune system-based treatments for cancer. 2010: Kors was the youngest recipient ever of the Geoffrey Beene Lifetime Achievement Award from the Council of Fashion Designers of America (CFDA) and received the Fragrance Foundation's FiFi Award for Lifetime Achievement. In January 2009, the estate of the artist-designer Tony Duquette sued Kors for trademark infringement after Kors allegedly used Duquette's name and images in promoting Kors' 2009 resortwear collection. In July 2013, he became the second luxury brand, after Tiffany & Co, to sue Costco for falsely claiming in advertisements that they sold his product. Kors was referenced in the 2006 film The Devil Wears Prada by Meryl Streep's character, Miranda Priestly. In the scene, Priestly sweeps into her office and gives a list of instructions to her personal assistant (Emily Blunt). Priestly says, "RSVP 'yes' to Michael Kors' party and I want the driver to drop me off at 9:30 and pick me up at 9:45 sharp". Nicki Minaj also mentions Kors in Big Sean's song "Dance". Drake also mentions Michael Kors in his song "From Time", and rapper Pusha T in his song "Numbers on the Boards". Additionally, Kors guest starred as himself in a Fashion Week themed episode of the hit teen show Gossip Girl; the same show that repeatedly showcases several pieces from his collections. ^ a b Lee, Joyce (August 17, 2011). "Designer Michael Kors marries longtime partner". CBS News. Retrieved October 24, 2014. 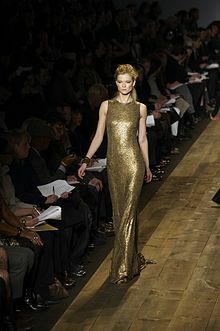 ^ "Kors' show a knockout Opulence, glitz dominate wardrobes". Daily News. New York. February 10, 2000. Archived from the original on November 9, 2007. ^ "The Michael Kors story". styl.sh. ^ Newbold, Alice. "Michael Kors Holdings Ltd Begins 2019 As Capri Holdings". British Vogue. Retrieved 2019-01-28. ^ "Capri Holdings Limited - Corporate Governance - Board of Directors". www.capriholdings.com. Retrieved 2019-01-28. ^ "Capri Completes Acquisition of Versace, Changes Name from Michael Kors (KORS)". StreetInsider.com. Retrieved 2019-01-28. ^ a b H.W. Wilson Company (1986). Current Biography. H. W. Wilson Co. p. 360. ^ Rappaport, Jill (November 2007). Mazel Tov: Celebrities' Bar and Bat Mitzvah Memories. Simon & Schuster. ISBN 0-7432-8787-8. ^ Andreoli, Richard (2005-02-01). "Working the runway: out designer Michael Kors tells it like it is to would-be fashionistas on Bravo's Project Runway". The Advocate. Archived from the original on 2007-11-09. Retrieved 2007-06-20. ^ "Michael Kors". Interview Magazine. ^ Rathe, Adam (August 18, 2011). "Michael Kors marries longtime boyfriend Lance LePere in barefoot Southampton beach ceremony". New York Daily News. Retrieved April 22, 2016. ^ a b "Michael Kors". Vogue. Archived from the original on December 27, 2012. ^ Lafaille, Rena (2 June 2011). "Seven Surprising Facts About Michael Kors". ABC News. Retrieved 4 October 2016. ^ Kilcooley-O'Halloran, Scarlett (January 24, 2013). "Michael Kors". Vogue. Retrieved April 22, 2016. ^ "Michael Kors: Retail's next billion-dollar man". cnn.com. ^ Wilson, Eric (February 27, 2009). "Mrs. Obama in Kors". The New York Times. Retrieved March 15, 2013. ^ Pezik, Anna (August 16, 2002). "Gwyneth Paltrow: 'Possession'". CNN.com archive. Retrieved 9 February 2013. ^ Atkinson, Nathalie (22 February 2011). "Oscar Scorecard: Best costume design". The National Post. Archived from the original on 11 April 2013. Retrieved 9 February 2013. ^ Wilson, Julee (2013-01-22). "Alicia Keys' Red Gown: Singer Stuns In Michael Kors Design At Inaugural Ball". The Huffington Post. Retrieved 9 February 2013. ^ Newbold, Alice. "Why Michael Kors's AW18 Campaigns Mark A New Chapter For The Brand". British Vogue. Retrieved 2019-01-03. ^ Team, ELLE India. "Exclusive: Bella Hadid is the face of Michael Kors' Spring 2019 campaign". Elle India. Retrieved 2019-01-28. ^ "Michael Kors Is Leaving 'Project Runway'". The Daily Beast. Retrieved 19 December 2012. ^ "Michael Kors Is Fashion's Newest Billionaire". Forbes. January 2014. ^ "Michael Kors' company suing Costco claiming false advertising". ABC. July 16, 2013. Retrieved July 17, 2013. ^ Shea, Erin (July 16, 2013). "Michael Kors protects brand reputation in Costco lawsuit". Luxury Daily. Napean LLC. Retrieved April 22, 2016.